It used to be that when a newspaper put out an “Extra” edition, it was filled with stories written by its reporters who had toiled away the night to cover some breaking news or collection of stories. Today, the New York Times is redefining “Extra” as stories written by others. It is turning on a new feature on its homepage called Times Extra that will start adding links from elsewhere underneath the headlines of its own articles. 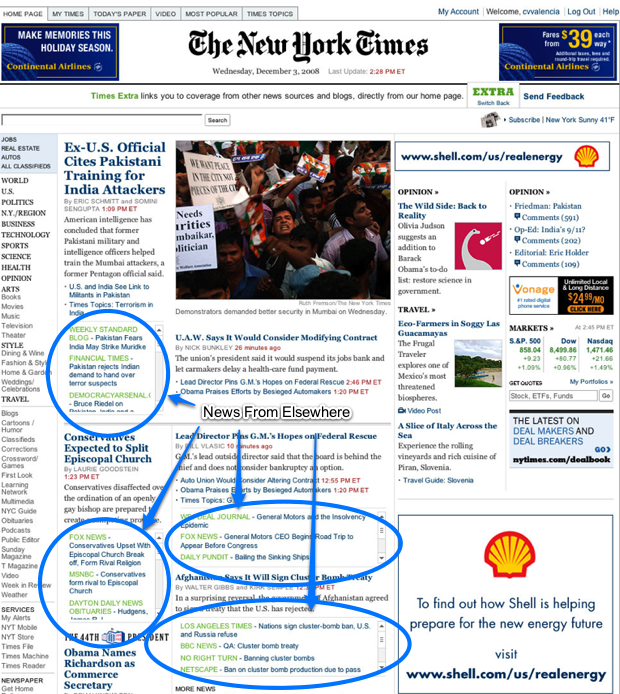 The related links are from other news sites and blogs (even the Wall Street Journal), with the source highlighted in green to differentiate them from the New York Times’ own stories. As you can see from the screenshot above, this adds a lot of unnecessary clutter on the page. (Don’t worry, it’s optional. That’s why they call it a beta). The links come from Blogrunner, the buzz aggregator the New York Times bought in 2006 2005. Blogrunner is a Techmeme competitor, except that it doesn’t really compete that well (see traffic chart below). Since last year, Blogrunner headlines have appeared on the site’s technology section. TechCrunch posts often appear on Blogrunner, as they do on Techmeme. Yet of all the sites that refer traffic back to us, Blogrunner is No. 185 and the New York Times is No. 51. Techmeme is No. 5. Blogrunner is just not a factor. That could be just us. Now, with Times Extra, these Blogrunner will move right onto the homepage. Maybe they will be harder to ignore there and will start generating more meaningful traffic. But my guess is that readers will find them distracting and annoying. While it is certainly enlightened of the New York Times to experiment with putting links to its competitors on its most valuable piece of online real estate, the experiment doesn’t really work. I would like to see these links on individual article pages because they do provide some good context and different takes on the same story. But they don’t belong on the homepage. The concept here is that if readers can find the best news and opinion from around the Web right from the homepage, they will keep coming back to it as a starting point, just like they do with Digg or Techmeme. Where this breaks down is that the reason I still have the New York Times as my homepage is that I want to see at a glance what is going on in the world—in business, in technology, in politics, and in world events. The editors of the New York Times do a pretty good job of distilling the world on that page. Once I know that the Mumbai attackers were trained in Pakistan, I don’t need three more headlines on the same story. That clutters the page, and leaves less room for other headlines. I want that page to maximize the number of different stories I can explore about different subjects, not different points of view on the same subject. When I want to see what the buzz is and all the different points of view about the most important stories, I go to Techmeme or Digg. Those sites are designed to filter the news and show me just that. They are easy to read and scroll through with headlines that take up nearly the whole page. The New York Times wants to have it both ways by jamming its news filter beneath its own stories and making readers squint to figure out which is which.